The luxuriant growth of the skunk cabbage comes as a bit of a suprise in eary spring as it emerges from the brown remnants of the previous summer’s vegetation in the bog garden. This aroid is a hardy plant with a tropical look and makes a dramatic display in large bog gardens and pond margins. The lush leaves of up to a metre tall sheath the dazzling inflorescences. 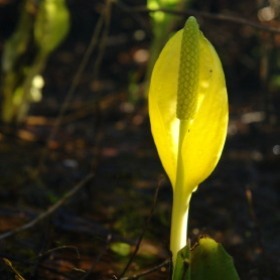 and the bright yellow ‘petal’ called the spathe likewise embraces the working parts of the inflorescence located on the centre spike or spadix. Clustered there are the tiny green male and female flowers. The spathe acts as a visual attractant, but also emits a powerful aroma of rotting flesh. The tip emits a chemical called indole, which is used in the perfumery and food industries. The spectacular display is probably best admired in the botanical gardens, because with global warming it is likely to become an invasive species. It also takes up quite a bit of room and the neighbours might not enjoy the ‘perfume’! better to try one of its smaller cousins – such as Zantedeschia beside your domestic pond.